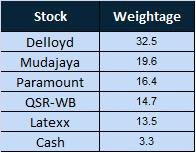 Delloyd (RM3.14): I feel it's a matter of time before it flies. I like their share buybacks, increasing contribution from bus manufacturing, plantation and riding on increasing car sales. An extensive report on Delloyd can be found here in The Edge. Click here for previous posts. Mudajaya (RM4.61): Ample opportunities to pick up Mudajaya at lower prices, though it can be risky pending announcements from SC regarding its disclosures on Indian IPP projects. However, looking at how Mudajaya came out to clarify and assure the investors/analysts coupled with working closely with SC as compared to other more dubious companies where CEOs go missing and so on, Mudajaya should be alright in this regard. In addition, "double joy" on announcements of potential IPP project in Laos and SC's email on letting Mudajaya off within a single day. Click here for previous posts. Paramount (RM4.63): Same old story on Jerneh. Potential fat dividend on the cards? Business direction good as well with greater expansion/diversification into education sector while corporate earnings in the past quarter came out very favorable. Click here for previous post. QSR-WB (RM2.07): More speculative. Looking at how the shares have been played up, a very big player is coming in. Recent news have been favorable such as expansion into India, potential acquisition of Yum! 's outlets and the resilient uptrend of its earnings. A good proxy to KFC which has shot up to the sky!! QSR currently trades at around 14.5x PER which is undemanding as it should trade close to other F&B counters which are at 17-18x PE levels in view of its leadership in the F&B sector. Should QSR goes up to RM5.50, QSR-WB could easily go up to RM2.50, more than 20% upside. Latexx (RM2.72): As mentioned in the previous post.